If you find yourself in a situation where you are insufficient of funds to start an investment, the best way is availing it through financing. I would like to call financing as an opportunity to buy time by borrowing money from another source. Financing would work in such a way that the buyer will just pay a percentage of the total selling price which are often called equities or down payments. Most of the equities or down payments required would be at standard percentage of 20% from the total selling price. For financing institutions who would like to be competitive, they would like to lower their down payment percentage to a rock bottom 10% of the total selling price. Your first payment would be the reservation fee of 20,000 which is good for the 1st 30 days (1st month). On the 2nd month from the date of reservation up to the 24th month, you will be paying P14,166.67 without interest. After you have completed your 20% Down payment, you will start paying your monthly amortization. This is where you would like to avail of the financing. Notice that the 80% Balance of 1,440,000 is taken from the total selling price of 1,800,000. The amount of 1,440,000 can be availed through different types of financing. Each financing has its own unique features and benefits. As the pyramid goes up, each specific financing institution would provide a higher interest rate with a lower payable term. Payable up to a maximum thirty (30) year term, with an interest rate as low as 6% per annum, this BENEFIT is only given exclusively to FILIPINO CITIZENS only. This is a special type of government agency that would provide housing loan benefits to the working class Filipino citizens in the country. It is a mandatory requirement for all employers in the Philippines to provide PAGIBIG benefits through the course of salary contribution from the employer and to the employee at a minimum rate of 200 pesos per contribution. The rate of contribution would also depend on the rate for loan entitlement. The interest rate for the housing loan will depend on the value you would like to loan. Don’t have Pag-ibig financing? Not to worry. With the growing economy, Banks in the Philippines are now very competitive on its rates. 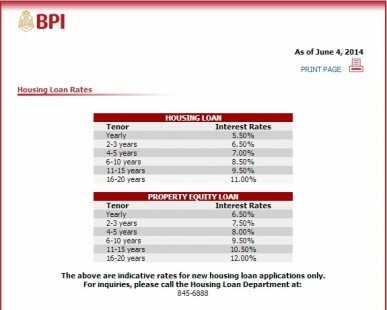 There are different banks that offer different interest rates. The only difference between Bank and Pag-ibig Financing is that, bank financing offers a lower payable term (most at a maximum of 10-20 years term). Bank financing works just as the same as Pag-ibig financing but requires more requirements to avail of the loan and the capacity to pay must be highlighted before the banks can grant housing loans. To determine your housing monthly amortizations, you need to be pre-qualified by the financing institution first. To acquire the monthly amortization chart or to determine the qualifications on how to avail of the Pag-ibig housing loan, please contact the author of this blog or visit any financing institution website. 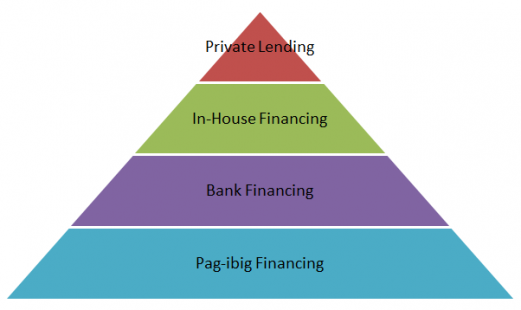 Not qualified for Pag-ibig Financing or Bank Financing? No problem. In-house financing is a type of financing where the buyer borrows money and buys time from the developer. An in-house financing institution is like borrowing money from a private lending with lesser interest rates that of that private lending institution. In-house financing however, has a very high interest rates and at a maximum payable term of 5 years than that of Pag-ibig and Bank Financing. So what is the benefit of availing an in-house financing? No more credit investigation. Say goodbye to long list of requirements on capacity to pay or the hassle of loan entitlement requirements. In-house financing provides an instant housing loan approval. Most foreigners avail the in-house financing when purchasing real estate investments in the Philippines. To acquire the monthly amortization chart or to determine the qualifications on how to avail of the In-house financing housing loan, please contact the author of this blog. In respect to borrowing money, I would like to include private lending institutions to my financing study. Although I would not recommend this type of financing when purchasing real estate investments, it does provide you a source of borrowing money. Private lending institutions are on top of my pyramid theory because it has the HIGHEST interest rates and the LEAST payable term ever known to mankind. This is not a very friendly method of borrowing money and can lead to very disastrous consequences on your investments. When push comes to shove, private lending institutions should be your last resort to borrowing money. To know more, please contact the author of this blog.